It is not a question of if a huge asteroid will threaten all life on Earth, but rather when, says one group of scientists. There is a 100 percent certainty that a giant asteroid capable of wiping out all or most of life on Earth will strike our planet, say a group of scientists and astronauts. The B612 Foundation, which is composed of astronomers, engineers, and many other types of scientists who have a keen interest in the Earth and its place in our solar system, is dedicated to providing a voice of the risks of asteroids and the options that we have for surviving them. In reality, it is not a particularly risky prediction to make, as there have been many extinction-level events on Earth in the hundreds of millions of years prior to our existence. The only real question is when an asteroid of that magnitude will strike us again, which could take hundreds of millions of years. But it will most certainly happen, and humanity would be wise to prepare. 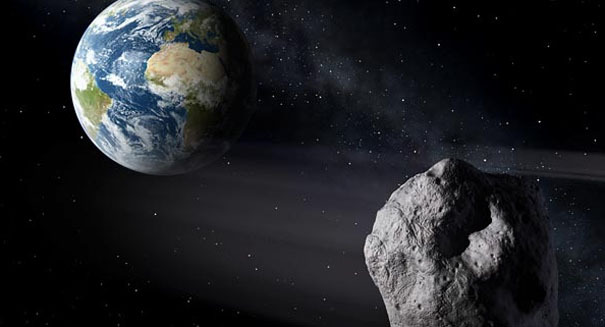 NASA and other space agencies have been closely watching space for asteroids that are both on a collision course with Earth and are big enough to cause problems. And they do not even have to be particularly big, as the Chelyabinsk meteor in 2013 caused more than 1,000 injuries and damaged thousands of buildings despite being just 20 meters in diameter. By comparison, the asteroid that caused the Chicxulub crater and likely wiped out the dinosaurs 65 million years ago was about 10 to 15 kilometers in diameter. But identifying this potentially existence-destroying asteroid is tough, because for one thing it is tough to spot all the asteroids floating around in space, at least with enough of a time frame to do something about them, and also we still really do not have any way to deal with them at the moment. Which is why scientists say we must focus more energy to such a project. The B612 Foundation is working on something called a “gravity tractor” that would tug the asteroid on a different course.